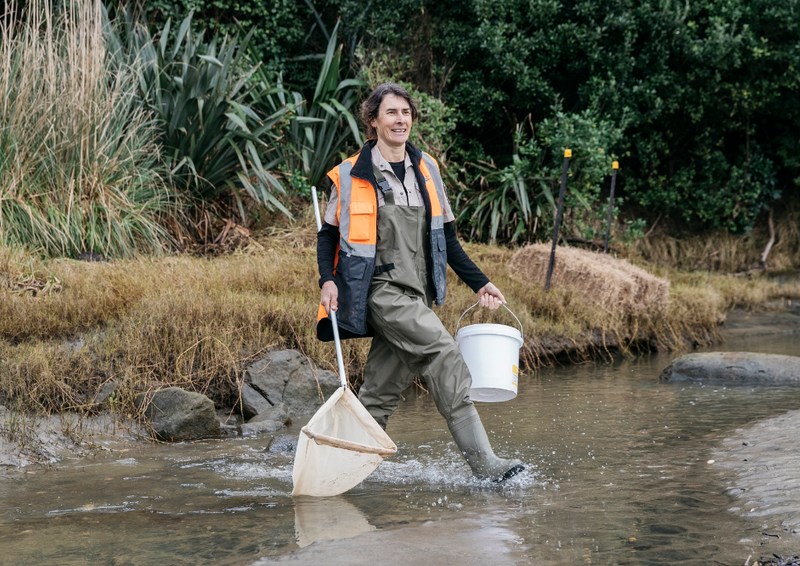 Shelley Hackett never thought she'd be running 'love hotels' for īnanga (whitebait), for example, but rivers run where they will. Shelley is one of Auckland Council's senior community waterways specialists, and works across the region helping endangered īnanga breed. Recently, she’s given a helping fin to Henderson-Massey and Hibiscus and Bays local boards as they restore the īnanga spawning habitats in their areas. Whitebait all over Auckland are struggling to breed and their populations are declining, with a number of factors contributing to the lonely state of the endangered fish. Artificial construction: barriers and weirs in rivers often block whitebait from reaching their breeding habitats, trapping them in the wrong area of the river or injuring them as they try to get up. Farming intensification: whitebait lay eggs in vegetated areas next to streams; modified riverbanks and livestock grazing at the edge of streams spoil the habitat for the fish and and leave their eggs high and dry. Pollution: nutrient run-off and sediment fills the spaces between rocks in stream beds, making them uninhabitable for whitebait. To save the love-starved fish, Shelley has been working to help them breed. Henderson-Massey Local Board has backed Shelley’s mission getting Community Waitakere and the Whitebait Connection on board to assess sites for potential inanga spawning and installing artificial spawning habitats at four sites across their area. They’ve now got the community on ‘Īnanga Lookout’ and are planning to restore five more spawning sites, remove weirs and protect egg sites from pests. Meanwhile, Hibiscus and Bays Local Board has started surveying streams for potential spawning sites with the Whitebait Connection. The community on-board to help monitor, restore and protect several sites – with a special splash of help from Ōrewa North Primary and Ōrewa Primary schools. They’ve now got the community on ‘Inanga Lookout’ and are planning to restore five more spawning sites, remove weirs and protect egg sites from pests. Meanwhile, Hibiscus & Bays Local Board have submerged themselves in whitebait work, surveying streams for potential spawning with the Whitebait Connection. The community is on-board to help monitor, restore and protect several sites – with an special splash of help from Orewa North Primary and Orewa Primary schools. carry out pest control on rats and mice that eat whitebait.